August 6, 2012: NASA's most advanced Mars rover Curiosity has landed on the Red Planet. The one-ton rover, hanging by ropes from a rocket backpack, touched down onto Mars Sunday to end a 36-week flight and begin a two-year investigation. "Today, the wheels of Curiosity have begun to blaze the trail for human footprints on Mars," declared NASA Administrator Charles Bolden. 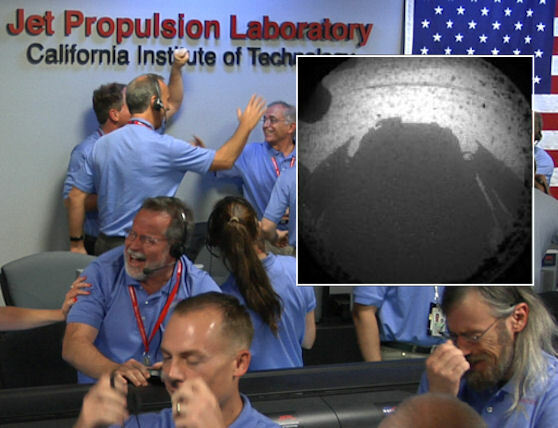 "Curiosity, the most sophisticated rover ever built, is now on the surface of the Red Planet, where it will seek to answer age-old questions about whether life ever existed on Mars -- or if the planet can sustain life in the future,"
"This is an amazing achievement, made possible by a team of scientists and engineers from around the world and led by the extraordinary men and women of NASA and our Jet Propulsion Laboratory," added Bolden. " President Obama has laid out a bold vision for sending humans to Mars in the mid-2030's, and today's landing marks a significant step toward achieving this goal."